This is unusual. Eddy Merckx and Miguel Indurain are sitting at the next table with Ernesto Colnago and Vittorio Adorni, Greg Lemond is standing chatting to Andy Hampsten and, just as we’re about to tuck into dessert, in walk Felice Gimondi and Mario Cipollini. Talk about name dropping. Clunk! Clunk! Clunk! 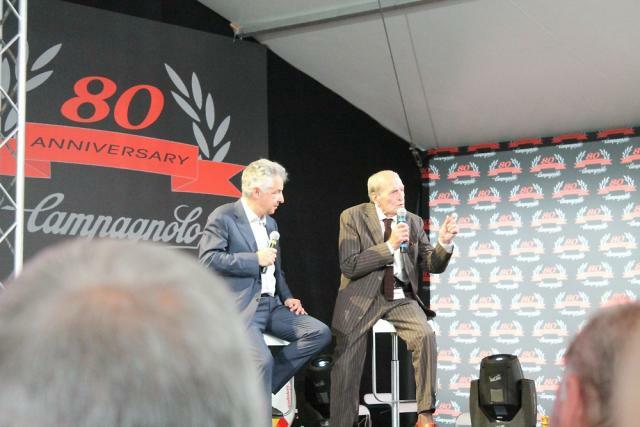 But you can hardly fail to be a bit star struck looking around at Campagnolo’s 80th anniversary celebrations here in Vicenza, Italy. The winners of countless Grand Tours, World Championships and Classics have come to honour one of the most prestigious brands in cycling, and to have a spot of lunch before stage 17 of the Giro d’Italia finishes in town later on. road.cc visited Campagnolo a couple of years ago to see how everything was made. This time it was a totally different kind of visit. We arrived with a couple of hundred people and, lunch aside, the main item on the agenda was a presentation about the brand that was established by Tullio Campagnolo back in 1933. Do you know what Tullio’s first product was? You might. It was the quick release skewer that he invented after losing a cold race because he couldn’t get the wheel off to repair a flat tyre. The company soon went on to develop hubs, derailleurs… and pretty soon its name was made. Essentially, we had a rundown of Campagnolo’s greatest hits from 1933 to the present day – the key products and the big victories. I love all this heritage. So 92-year-old former racer Alfredo Martini told us about racing in the 1940s and his friendship with Tullio, who died back in 1983. Jan Janssen told us about winning the Tour de France, the Vuelta and the World Champs. Vittorio Adorni spoke about his Giro win and world title. 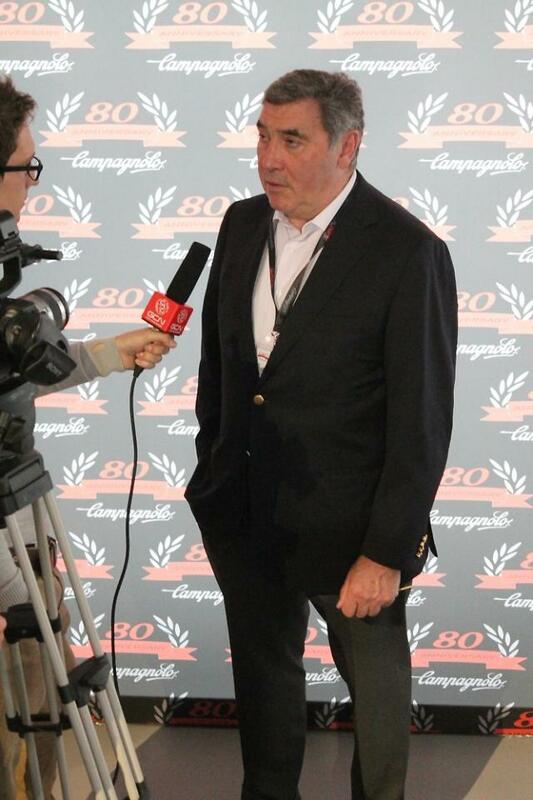 The biggest round of applause of the day went to Eddy Merckx. The compere listed a few of Merckx’s achievements: five Tour de France wins, five Giros, a Vuelta title, three World Championships, the hour record… you know, the best in history by miles and miles. 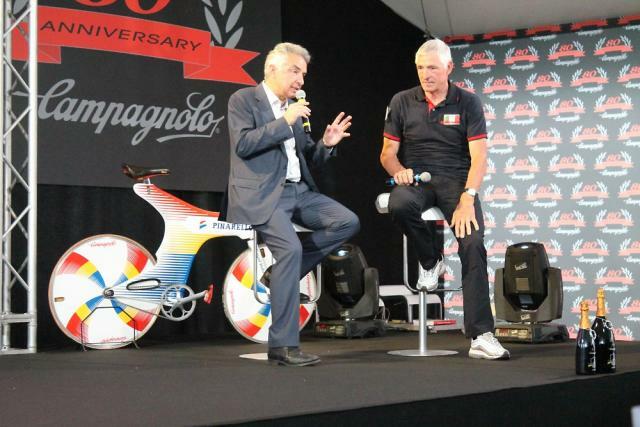 Then up comes Francesco Moser to talk about his rivalry with Merckx, and how he screwed his shoes onto the pedals before the invention of clipless systems. He tells us that the best moment in his career was winning the Giro d’Italia in 1984. Greg Lemond talks about beating team-mate Bernard Hinault (the only one of the three living five-time Tour de France winners who’s not here) in 1986, and Miguel Indurain tells us about his career and battling Marco Pantani. That’s a total of 33, if I’ve got my figures right. It’s all a bit nuts, really. There’s a massive slice of cycling history right here in this room. 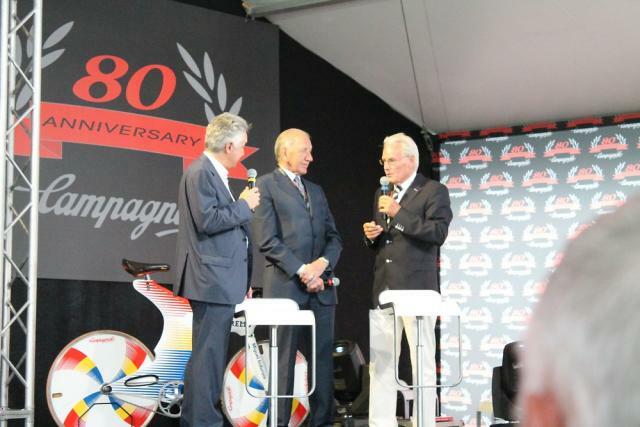 When a brand as influential as Campagnolo throw a party, it looks like the big names in cycling show up. 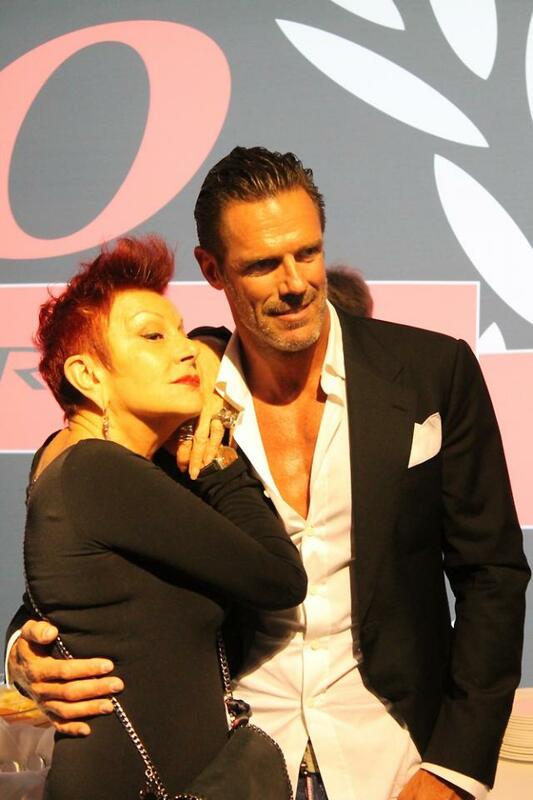 And just to finish off, here's a picture of Mario Cipollini being Mario Cipollini. There's nothing about this photo that I don't like. Class! That party looks mustard, although I'd probably have been thrown out for throwing my leg over Big Mig's Pinarello. 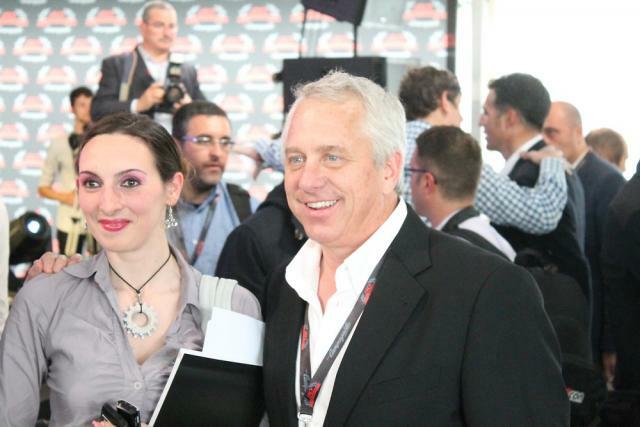 Who is that with Greg Lemond? And more importantly - Is that Campagnolo jewellery she's wearing? Wow that sounds like some star-studded bash. Your eyes must've been out on stalks Mat. So why no Hinault? They must've tried. Or did he use, ahem, another brand? Nice pic of Cipo with shirt slashed to the waist! It's not often I get starstruck, but that was just ridiculous. Hinault did use Campag. I think he was in Yorkshire at the time of this bash. Not sure who that is with Lemond. Cipo: do you mean the pic in the gallery? It's classic. Actually, I think I'll promote it into the story proper. It was funny how everyone else was there from the start, went to the presentation, did interviews and stuff. You know, they all put in the leg work. Then Cipollini rocks up just in time for dessert, pretty much reflecting the whole of his racing career. And why wouldn't you? 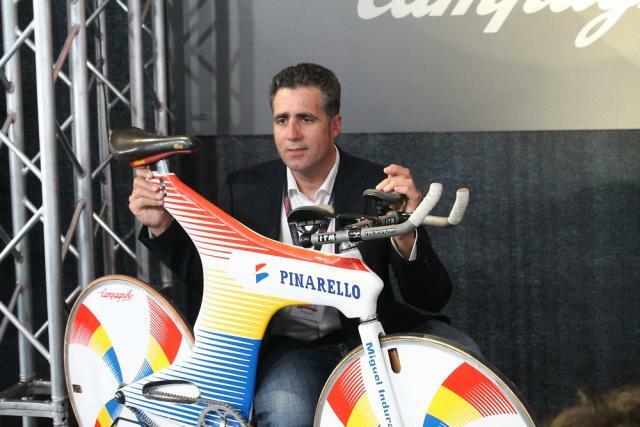 That Cipo picture makes me feel all funny. Surely Cippo buggered off after the starters and got a nose bleed when he 'climbed' onto the podium? Is Cipo really THAT orange? Those interested in seeing that Pinarello TT Bike , will find it in the shop , above to the right as you walk in from the plaza . Old man P. no longer goes into the shop each Morning , age catching up with him . Are you saying you got fed as well ?